As an early adopter, at least across many product categories, I enjoy keeping my eyes and ears open to find out what's new in the world. This includes the printing and imaging industry, the focus of my professional interests for the majority of my career, and also encompasses the broader tech world. 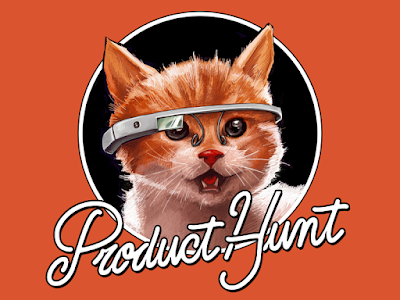 And just about every day, that means a perusal of Product Hunt is part of my routine. Both fun-loving (see their Glass-wearing mascot above) and comprehensive, it is an increasingly popular website for many, it has grown into being one of my favorites too. 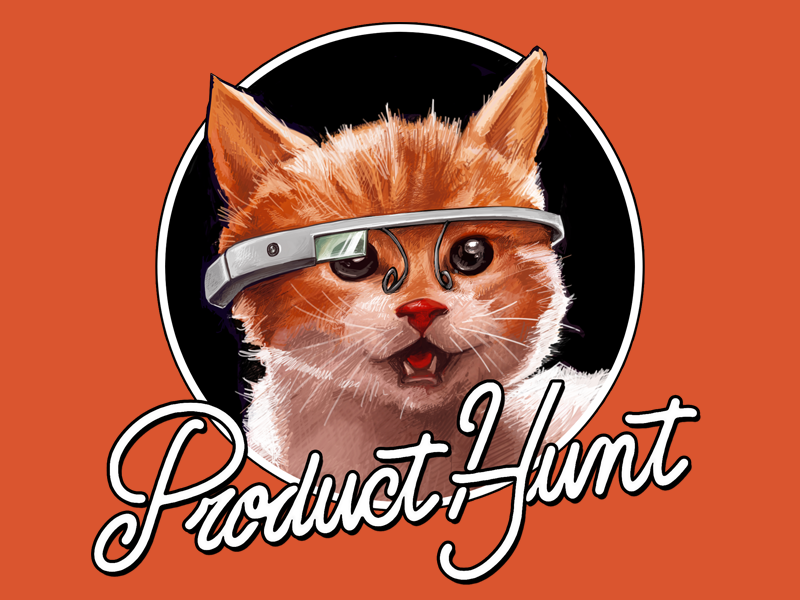 Product Hunt offers a daily refresh of a wide-ranging selection of tech innovations, with links to the products/solutions as well as offering readers the opportunity to “upvote” and comment, oftentimes in the form of dialog with the developers. The aforementioned Turtle Mail is one example of a recent discovery, found via my daily scan, and it proved stimulating. (A Product Hunt Chrome Extension I have installed means every time I open a new tab in my browser, the day’s Product Hunt entries come up, meaning it’s pretty hard to avoid!) Having been reminded again in the last few years of seeing the world through the eyes of small children (grand-parenthood will do that), I couldn’t help but be intrigued. It also takes me back to Observations and a multi-part series I started in October 2008 (see “Observations: Sharp-Eyed Hard-Copy Marketers Help the Aging”) highlighting two products where hard copy served as the communications medium with the oldest, rather than the youngest family members. Turtle Mail could be worthy of a future dedicated post, as well. A little search effort to go along with daily scanning can still yield interesting quarry, too! A recent search of the Product Hunt database, using keyword “Printer”, comes up with a list, and the first three entries (see screen shot above) all made a connection for me. Printer Pro by Readdle, described as a “printer client” but what I would call an app, is from a suite of products by a company who I have followed and written about for some time now. Surprisingly, they never seem to have made it into these “Observations” pages, but I covered their printing and scanning apps during my days writing for Lyra Research and Photizo Group. The third brings along a bit of a sad story, and points to a somewhat universal social media issue of handling the presence of the recently passed, both people and products. That number three on the list is Little Printer, chronicled here on many occasions (starting with “February 2012 Observations, Lessons from theLittle Printer That Went Viral”),but pulled from the market in September, 2014. It continues to be listed on Product Hunt, though in its comments section, the shut-down of Little Printer is noted. It’s not just the small companies and start-ups who get space in Product Hunt, I should add. Coverage of offerings from industry mainstays is included as well, but on a sporadic basis. As the ideas to be included come in from readers, I feel a responsibility to submit nominations for inclusion, as I see industry innovations pop up. And I will keep doing my Product Hunting, and enjoying it! Just the collection of my thoughts for this post has me thinking ahead to some future profiles. So watch this space! Product Hunt had fun with alliteration on this one! It seems like it has been way too long since my last "(fill in the blank) Printing" post, once a staple of Jim Lyons Observations. Going back to 2007, and beginning with my "iPhone Printing" , I have been around for a wide variety of similar posts, summarizing questions, tests, and news related to new gadgets and platforms, and their abilities to generate hard copy. So, in the spirit of "way too long", comes this note on printing for that very popular social media platform, Pinterest. I am a long-time Pinterest member, thanks to another social-media-savvy family member, but truth be told, very light on the usage axis. In searching Product Hunt for a coming monthly Observations feature, Pinterest Printing from Printerest (a "say that three times" special) percolated to the top of print- and printer-related innovations, of the type that Product Hunt is famous for. It seemed only natural to give it a whirl. It's a Chrome browser extension, and after refreshing my crowded brain with just what Pinterest does and how it works (e.g. what's a board? ), it worked like a charm. The solution is from normally.com, and their story is detailed on Medium, in a piece titled "Let go, and let users. How Pinterest wouldn’t let me build something for their users. So I built it anyway." On this morning of another highly anticipated Apple announcement, speculation surrounds a new, smaller iPhone and a new iPad. And perhaps something having to do with the Apple Watch. For example, see "Apple to unveil iPhone SE, iPad Pro, new Apple Watch tomorrow" - where "new Watch" in the headline actually refers to "latest Apple Watch bands" in the text. Creating value with watchbands just "does not compute" for Apple co-founder Steve Wozniak, who took on his disillusionment with the company's current approach in a Reddit Ask-me-anything last week. Woz covered lots of ground including the FBI/Apple encryption battle, but summaries (like the UK Wired story, displayed above) tended to focus on his criticism of the company for pursuing product differentiation via aesthetics. I worry a little bit about - I mean I love my Apple Watch, but - it's taken us into a jewelry market where you're going to buy a watch between $500 or $1100 based on how important you think you are as a person. The only difference is the band in all those watches. Twenty watches from $500 to $1100. The band's the only difference? Well this isn't the company that Apple was originally, or the company that really changed the world a lot. One can argue with his opinions, and even see him as too "old school" and not really understanding modern economics and marketing. But his thoughts took me back to what could be thought of as the very first "smartwatch", the HP-01, introduced in 1977, about the same time the two Steves were just getting Apple Computer off the ground. Hewlett Packard was still essentially an instrument-dominated company back then, with a leading position in high-end electronic calculators. 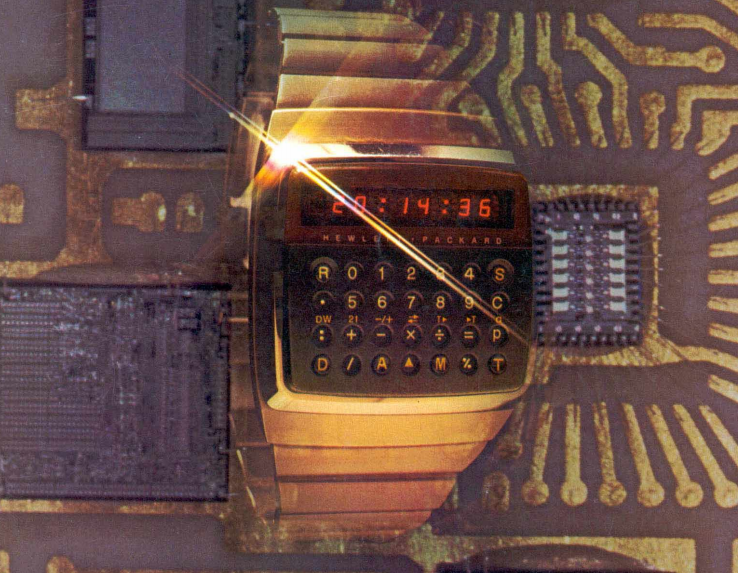 Taking on the design and production of a "calculator in a wristwatch", as stated by founder Bill Hewlett "because he wanted one", at least as legend has it, met with enthusiastic efforts by the engineering teams, seeking to follow the company's driving culture of making "technology contributions". The product did not succeed in the market, and was long gone before I joined the company in 1981. The folklore surrounding it had not disappeared, however, and the technological feats involving integration and miniaturization, as well as the marketing feats involved in opening a new sales channel. So having a great deal of cultural overlap with the original Apple and its co-founder, Steve Wozniak, my view is that the Apple Watch itself is a huge technology contribution already, with more and better anticipated for the future, if not today. As far as all the aesthetics and luxury-goods pricing, I get Woz's drift! With the launch of Nike's HyperAdapt adaptive lacing running shoes, I had a little fun thinking back to an MBA-level marketing class I taught a couple of years ago for University of Phoenix. One of the class assignments, pretty typical for a class of this type, was to come up with a product idea and development a marketing plan for up to and including product roll-out. One of our teams came up with none other than the self-lacing, self-tying shoe. The acknowledged it was "not quite" an original idea, with a nod to the 1985 movie, Back to the Future, and as I remember it, the team's definition of target markets (it had several) included Baby Boomers, who were having a harder and harder time bending over to tie their shoes. It couldn't have been the influence of their boomer professor, right? Anyway, hat's off to Nike for their ongoing innovation, and happy memories of a fun student project. It's the icing on the cake, indicative of many of the reasons I enjoy my teaching so much! I am in the process of "pivoting" (had to get that in) to doing more analysis and blogging in this space, potentially losing out on some of the excitement of printing and imaging (but I will try not to). So to get it started, I will be regularly noting some observations, this being the first. This week has been a bit of a mixed one for the Apple Watch. First, as we approach the next big Apple event on March 21st, not much is anticipated in terms of Apple Watch announcements. I did find CNET's @sharatibken speculating on possible new bands or watch software, even tying the theme "Let us loop you in" to something watchband-related, we will see if the general consensus is true that it will continue to be rather day on the Apple Watch front. And then today and a quick search of tweets regarding Apple Watch. The first three of substance all related to heart monitoring (see below). Seems like a niche, but maybe a concentration around the product's true strength/value proposition? The definition of product positioning which follows, from Marketing Management (2011) by Philip Kotler and Kevin Lane Keller, a well-known text and one I have used in my teaching, is about as basic as it gets. But just because it's basic, it doesn't mean it's easy! occupy a distinctive place in the minds of the target market. Speaking of teaching, I think I will use this very example in the coming weeks, as my Consumer Behavior class takes on the Art of Product Positioning! We shall see what the students make of it, and whether they agree that overall, HP has made it all just about as clear as we can hope for!